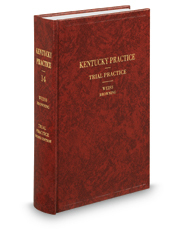 Trial Practice is a practical, easy-to-use guide to civil trial practice in Kentucky. The authors present the basics that contribute to a successful practice and discuss topics ranging from building a practice to prelitigation discovery, settlement, and trial, as well as tactics and strategies. The text offers practical examples for illustration and contains an extensive collection of forms, which can also be found in a customizable format on the disc that accompanies the book.